I love this diaper! The colors are great and this will work for boys or girls! Thirsties Hala Kahiki and Main Squeeze Limited Edition Prints! This is Thirsties Limited Edition in Hala Kahiki and Main Squeeze. 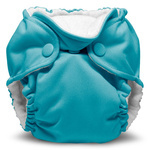 This is such a pretty diaper. The color is so vivid, really feels like spring and summer! We love blues and this limited print is so pretty!